The show will share our work in the forest with Suffolk Punch Draft Horses used in the practice of Restorative Forestry through "worst first" single tree selection, precise directional timber felling and the ultimate low impact overland extraction method of modern animal powered logging. It will also include some discussion about our production of open pollinating non-GMO corn that has been developed to be short season at 87 days maturity and short height for growing at higher elevations that have shorter growing seasons and more wind. There will be some film of grassland management by clipping pastures. Suffolk horses will also be highlighted as our choice of draft animals to assist in our farming and logging operations. 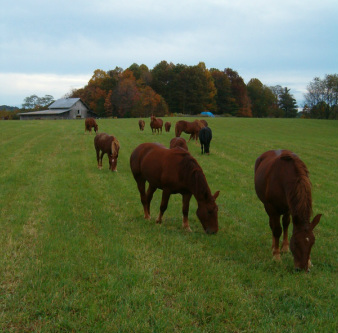 But if you're not able to catch these TV shows you may see the horses working in person in the county at the Shelor Family Foundation property in Floyd County during the "Open Woods Week" planned for the week of 27 October through the 1 of November. We will put a notice of this event in your hometown newspaper - The Floyd Press. For more information about all these activities you may contact: Jason Rutledge at: 540-651-6355 or 540-798-1828 cell. Ridgewind Suffolk Farm breeds, works, trains, and sells registered Suffolk Punch draft horses. We keep a herd of mares and some geldings, and often have harness broke Suffolk Punch horses for sale. Our registered Imported English Stallion - Eyke Sovereign - 3396-S is available for breeding or artificial insemination. We are located in the Blue Ridge mountains of Floyd County, Virginia. We strive to create a culture that is rooted in meaningful work and a deep collaboration between horse and human. Depending on the season, our horses perform many tasks: plowing, cultivating, pulling wagons and sleds, skidding logs and much more. We offer classes and workshops for all skill levels. Topics include harnessing, hitching, driving horses, horsemanship, and horse-powered restorative forestry, logging and farming. We can also train your horses for work.